Select Create Appointment from the Add Another Event dropdown menu. Set the Date, Time, Timezone, and Appointment Type here. This allows Parsey to convert it for Infusionsoft. This is to verify that the Date/Time is getting parsed properly. Do not set duration - Choose this if you do not wish to set a time constraint on the appointment. Use an extracted field to define the duration - Choose this if you wish to set the duration of the appointment based on data in the email. Enter a value to manually define the duration - Choose this is you wish to set the duration manually and have it be the same for every appointment. The Type, is whether you want the appointment duration to be set in minutes, or hours. 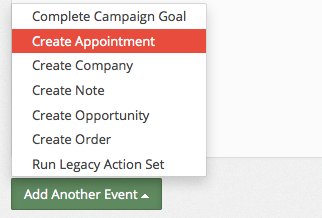 To create the appointment, you must assign your extracted fields to appointment fields inside Infusionsoft. To do this use the dropdown menu on the right. You can use an extracted field to find the user, or you can enter a custom value to find the user. If you use an extracted field, choose the corresponding field in the right dropdown menu. Search Field - This is determined by the content of the Sales Rep field you extracted. For example: If Sales Rep = John, then Search Field = First Name. Once you are finished configuring the appointment, click Save Appointment, and you're done!